So you purchased—or perhaps built—some awesome planters. Hooray! Planters are easy to fill with great stuff in the summer, but if you don’t live in a tropical paradise, what happens with those planters the rest of the year? With the cold comes the opportunity to start anew and create some fall, winter and spring interest. This article discusses some ways to build year-round interest in your planters. Make sure your summer foliage lasts as long as possible. 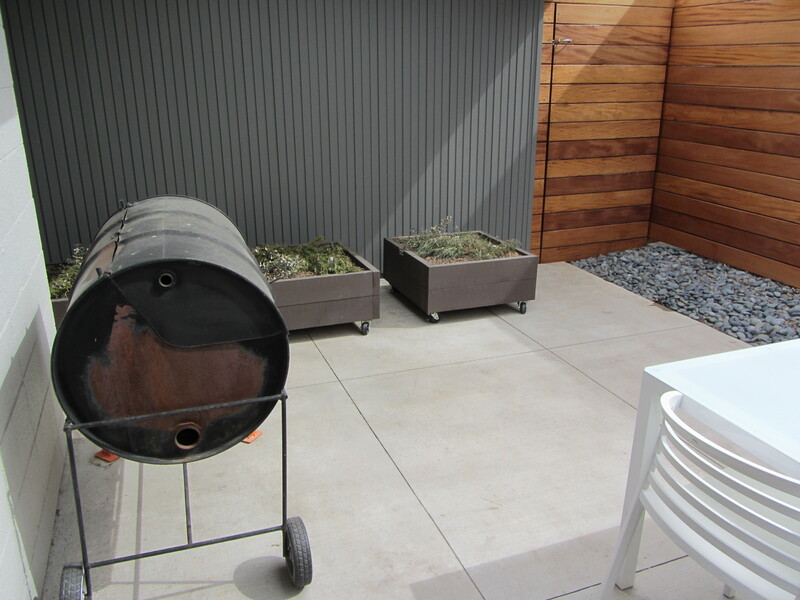 Prepare your cold-snap arsenal | My summer plantings lasted well into the fall by putting the planters on rollers. When we get those early frosts I can roll them inside the house or into a more protected part of the yard, such as under an eave or near a warm side of the house. You can attach the rollers directly to some planters (you could get wheels such as these at a place like your local hardware store) or you can set your containers on rolling plant caddies like this one. To complete my arsenal, I also got frost covers (something like this) to help with light frosts. With the frost covers I simply trim them to the right size and put them over the plants. Be sure to tuck the edges of the frost cover into the pot, to create a seal around the plants. Get some good-looking dead plants | Also, think about what your summer plants will leave behind once they die. Some plants turn to mush once they freeze, (think about really fleshy plants like tomatoes, impatiens or banana plants) but others hold their shape quite nicely. For example, when grasses die, they can leave behind very pleasant foliage. Eucalyptus dries to a nice shape. Just keep them in the containers for winter interest. And as more tender plants begin to die during frosts, don’t just rip out everything in the container. Pull out more tender plants as they die, and slowly decrease the number of plants in a container. Once the containers start to look a little sparse, then you can start to fill them with things that will look good during the winter. Fill the planters with free winter interest. Which brings us to what can you add to your planters in the winter. Contrary to popular belief (at least what I think is popular belief given all the sad empty planters I see during the winter) you can have a lot of fun with planters in the winter. And, amazingly, it doesn’t have to cost much or anything to fill them. I like to fill my containers with fun free winter items that I find in my yard, or perhaps in a neighbor’s overgrown yard. Think about things like evergreens—including broadleaf evergreens—that could use a trimming, such as euonymus, pines or junipers. Or perhaps nice twigs, such as red-twig dogwoods or birches. Or something with some winter fruit or berries, like some hawthorns and crabtrees. Or cool grasses somewhere else in the yard. Or maybe some pinecones. The list goes on and on. Once you gather up these items, the key is not just to pile them up in a container. Arrange them in some way that is appealing. Maybe there is a cluster of juniper with some sprigs of eucalyptus peeking out from the junipers. Maybe a spray of twigs and grass nestled in some northern white pine branches. Or maybe you get abstract and line up with pinecones in a grid pattern. Whatever you do, just make it look purposeful. 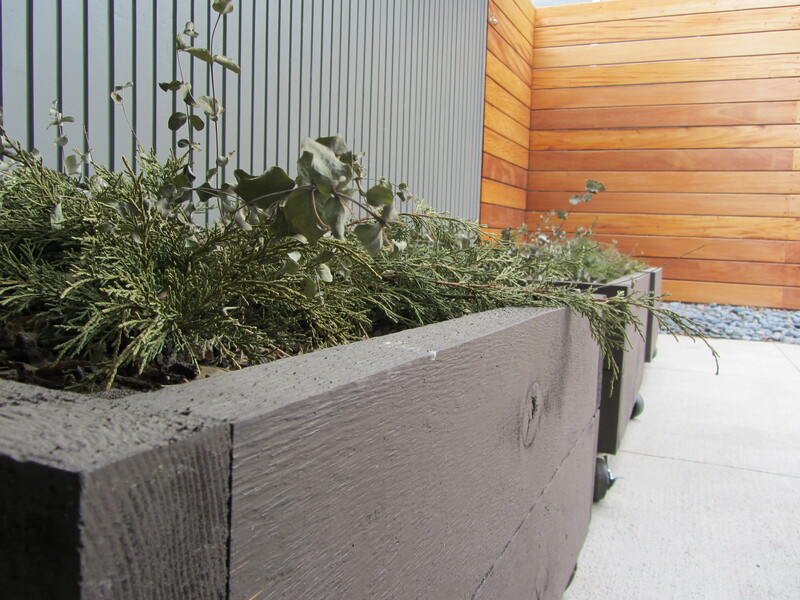 Below are a few pics of winter interest planters. 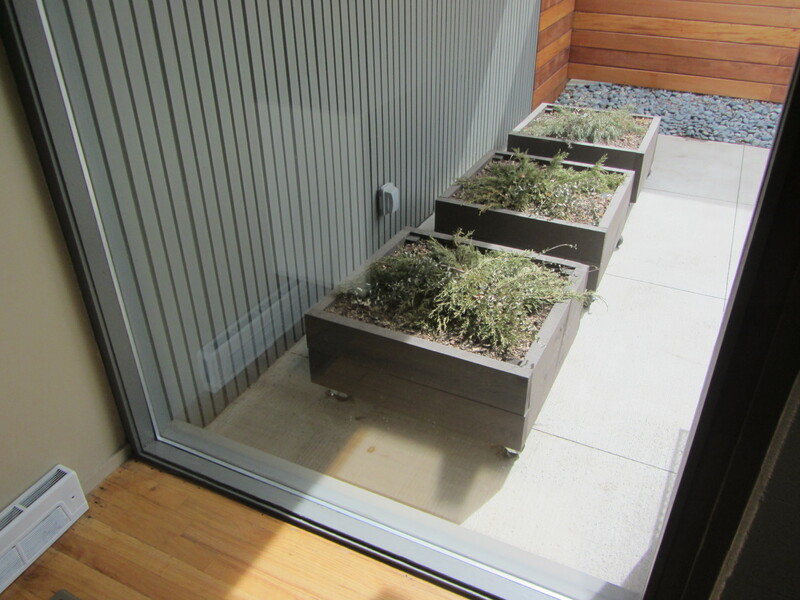 For those of you with some money to spare, small living evergreens can also be nice touches. You could leave them in the pots you bought them in, so you easily take them in and out of your larger containers (think large-scale bonsai project). You could certainly toss the evergreens when you’re done with them, but you could also store them in another part of the yard during the summer. Or maybe those living evergreens can even stay in your containers year-round as you change out the plantings around them. Get a jumpstart on spring. When you’re filling your planters with winter interest, don’t forget to think about spring. Think about tulips or other bulbs that could introduce early spring color as winter foliage starts to fade. Depending on your region, plant bulbs in the fall or early spring (some bulbs need chilling time, and others come pre-chilled for warmer places) For cheapskates like me, I’m going to throw some wheatgrass on my planters in the early spring to provide some green that the yard so desperately needs that time of year. Any seed that sprouts early can add interest. I’m also considering doing some lettuces to what happens with them (and I can roll my containers inside if things get a little chilly). Another approach to maintaining year-round interest in your planters is to make them indoor-outdoor containers. You can fill your containers with tropical plants, keep them in the house during the winter, and then send them outside in the spring. In summer, you can add some additional plants to the containers to fill them out, such as coleus and impatiens. Some traditional “outdoor” plants, such as geraniums, can also make cool indoor plants that bloom year-round. One of the coolest successes I’ve seen with this approach is one fall when we lugged a 10-foot banana tree inside just as it was getting ready to flower (and a frost was approaching). We ended up getting some bananas that winter. Now that’s a good way to help keep the depths of winter at bay! Well, there are some ideas on ways to add interest year-round to planters. H. Christine Richards is a landscape designer specializing in mid-century and agriculturally modern landscapes in Denver, Colorado. You may reach her at hchristinerichards@hotmail.com.